Originally published on Climate Central. Natural gas as a means to produce electricity is being hailed by the Intergovernmental Panel on Climate Change as the fuel that can act as a “bridge” between carbon-heavy coal and zero-carbon renewables, helping to reduce humans’ impact on the climate. The idea is that burning natural gas involves fewer greenhouse gas emissions than burning coal. 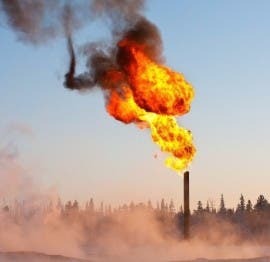 The IPCC in its Working Group III report says natural gas as a bridge fuel will only be effective if few gases escape into the atmosphere during natural gas production and distribution. Flares burn off excess methane at an oil and gas field. But a study published Monday adds to the growing evidence those escaping gases, called “fugitive” emissions, are numerous, especially methane emissions while a well is being drilled, a phase of well development previously thought to emit little if any methane. Over a 100-year timeframe, methane is about 35 times as potent as a climate change-driving greenhouse gas than carbon dioxide, and over 20 years, it’s 84 times more potent. Natural gas drilling could emit up to 1,000 times the methane previously thought, possibly significantly increasing the greenhouse gas footprint of the production of natural gas, the study shows. The study, conducted by researchers at Purdue and Cornell universities and other institutions, is one of numerous studies conducted over the past several years that have discovered methane leaking from oil and natural gas wells, pipelines and hydraulic fracturing operations. The studies generally agree that methane leakage is significant in many areas, but some question the overall impact to the climate. A University of Texas study found last year that natural gas wells leak methane at about the rate reported in U.S. Environmental Protection Agency methane emission inventories, and the leaks can be contained with emissions control technology. The author of that study, University of Texas-Austin chemical engineering professor David T. Allen, could not be reached for comment Tuesday. EPA inventories are compiled using the industry’s own measurements of emissions at well sites. Using those numbers, the EPA extrapolates to estimate total methane emissions for an entire region without actually measuring emissions throughout the area. The EPA estimated in 2011 that natural gas drilling accounts for about 1,200 gigagrams, or 2.6 billion pounds, of methane emissions each year from well completions, equipment leaks and pneumatic controllers. “Flowback,” one of the final stages in well development after fracking, is estimated to emit an average of 81 megagrams of methane per operation. The EPA’s most recent geenhouse gas inventories show that natural gas production and distribution is the second largest source of methane emissions nationwide, just behind methane emissions from livestock. But the new Purdue study suggests the EPA’s inventories may not be quantifying all the methane emissions from wells being drilled because few people have measured methane leaking from wells in the earliest stage of well development — the actual drilling itself. “Some inventories leave emissions from drilling out entirely because it is assumed to be negligible,” study co-author Dana Caulton, a Purdue Ph.D. candidate, said Tuesday. The study shows that during drilling, as much as 34 grams of methane per second were spewing into the air from seven natural gas well pads in southwest Pennsylvania — up to 1,000 times the EPA estimate for methane emissions during drilling, Purdue atmospheric chemistry professor and study lead author Paul Shepson said in a statement. “This indicates that there are processes occurring — e.g. emissions from coal seams during the drilling process — that are not captured in the inventory development process,” he said. To determine emissions rates at natural gas fields in Pennsylvania’s Marcellus shale gas fields, the researchers used emissions data gathered from an airplane that flew over natural gas wells in southwest Pennsylvania in June 2012, some of which were in the process of being drilled. None of the wells in the area were being fracked at the time, and none were in the “flowback” stage, according to the study. He said regulators have always thought that there are few emissions during the drilling process, but when drilling rigs drill through shale layers containing a lot of natural gas, a pressure pulse will send gas out of the well and into the atmosphere. A typical natural gas drilling rig. The methane leak rates found in Pennsylvania were similar to those found in the atmosphere near natural gas fields in Utah’s Uintah Basin and Colorado’s Denver-Julesberg Basin, showing that methane leaks are widespread in natural gas fields across the country, the study says. The study says there is an urgent need to identify and plug methane leaks in shale gas production nationwide. But identifying and shutting off all the leaks in the natural gas production and distribution system in the U.S. could be costly.